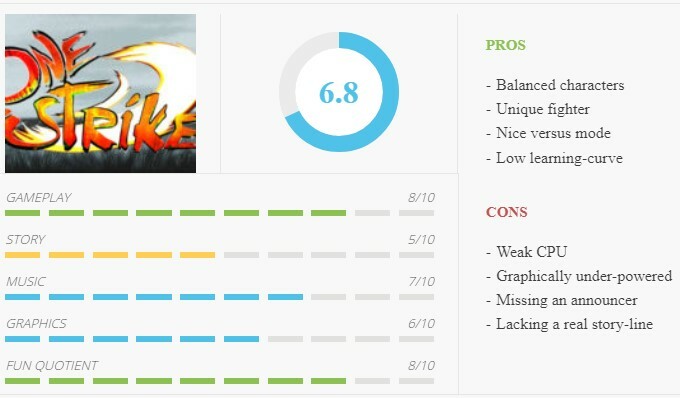 One Strike is a surprising take on the age-old 2D fighter genre rehashing retro graphics, chip-tunes, and tight controls. The game features 4 different modes for you to compete in; One Life, Arcade, Team Duel, and Tournament. Want to climb your way to the top quickly? Participate in the tournament mode as you face your opponents while advancing the brackets. Think you have what it takes to take all comers? Try your luck in One Life, where you will have to defeat all 6 fighters while you are only one strike away from failure. In team battle, you go at it using a selection of 3 fighters. Arcade mode gives you 5 lives, making it the best place to start when trying out a new fighter. 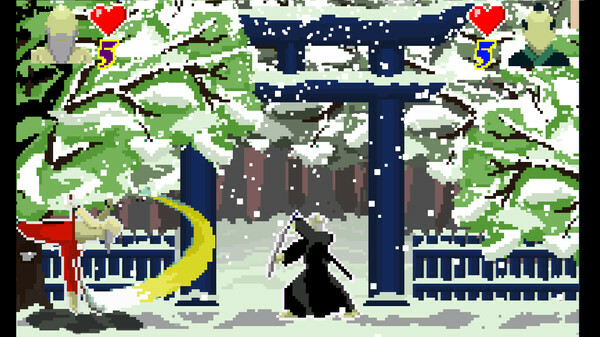 Select one of the six unique fighters and embark on a quest to conquer Japan – yes, conquer Japan. Choose your fighter well though, for every single one of them has a distinguished fighting style which will determine the outcome of the upcoming battles. Varying in degree of speed, attackable distance, style of defending and even general movement One Strike offers enough variety to play for numerous hours battling the CPU or against a friend. There’s no jumping or player swapping in this game which ensures you’ll always be facing your starting position. 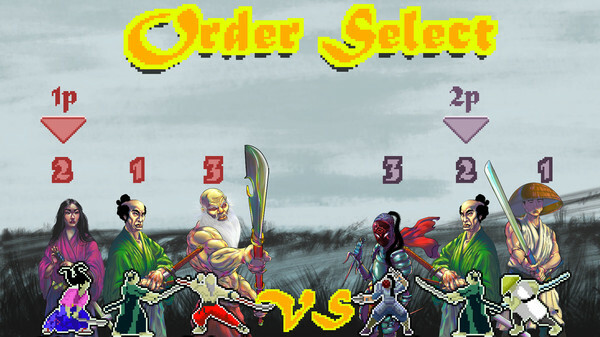 With only a few buttons to master, the player can quickly get a handle on their fighter of choice. The key to victory is to get familiar with the move-set of your selected character, as much as understanding your opponents’. Facing Hinode? Be sure to stay on your toes as lightning-speed attacks are guaranteed. Battling Hangaku? Stay out of reach of her Kusarigama which can strike at any time after threateningly whirling it while she descends towards her target. On the backfoot against Tomoe? Ensure to time your block well as her Wakizashi’s second strike comes unexpectedly. It makes for an interesting strategical fighter as One Strike sets itself apart from the competition by employing a one-hit-one-kill mechanism. That’s right, one hit and the battle is over, just like real life, one strike is all it takes. Every character has their own dying sequence kicking in after a quick slash, blood splatter and soundbite which always stocks my breath as I struggle to see who struck first. Though I was sure of my victory seeing the enemy collapse to the ground I breathe a sigh of relief as I advance to the next round only to go through the same anxious seconds again and again. As with any fighter, a small cooldown window after every attack or defensive move leaves the opening you should be looking for to strike. Battling CPU opponents in easy mode is just what can be expected and should be a good place to start. Getting the hang of it though, it might be a good idea to just dive into hard mode to look for more competition as the normal mode is not that challenging still. Having mopped the floor with all of your opponents you are thrown back to the main menu’s accolades, where the last victorious fighter is selected with a green background showing you have claimed your victory over that specific mode, difficulty setting and used fighter. Apart from the hand-drawn character portraits, graphically the game doesn’t manage to impress other than the chest-tightening conclusion of every single fight. The graphics don’t do the game justice and a more NEO GEO approach would be more befitting a fighter of this caliber. The different stages are nicely done while the outlining of the players, making them easier to identify, isolates the fighters a bit too much. 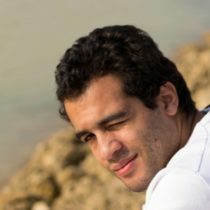 Oddly, a fight cannot be paused, being it in multiplayer or fighting a CPU opponent, as pressing the pause button will pop up a ‘P’ at the top of the screen indicating the game will be paused after the fight concludes. The music playing through your fights is fitting, while the sound effects are simple yet effective, though the game could have used an announcer adding some flair while selecting your character. 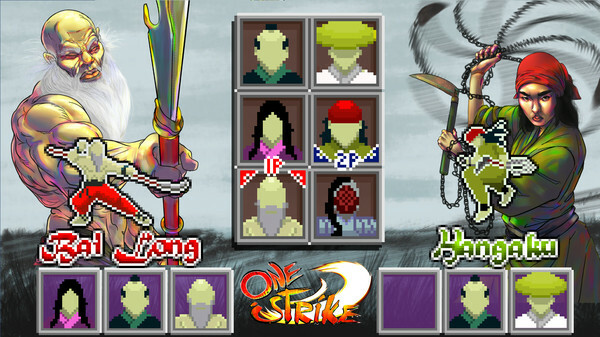 Overall, One Strike is a very competent fighter with distinguishing characteristics in an otherwise crowded genre. The one-hit-one-kill mechanism is a welcome variation and the unique elements of each fighter keep the game decently balanced. While there is room for adding in some more fighters through a patch or update, the roster feels complete. For a competitive fighter the CPU feels a bit too weak even at hard mode, while battling a friend never bores. 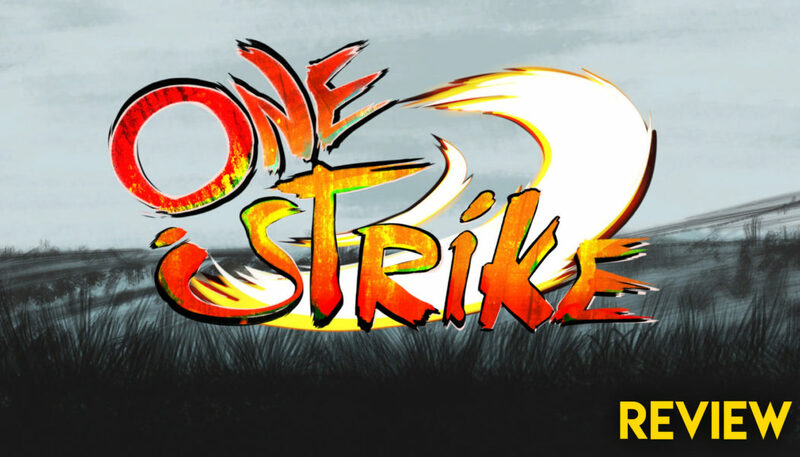 One Strike is a definite must buy for anyone looking for a quick fighter without spending hours mastering the special moves looking for that frame-specific attack.